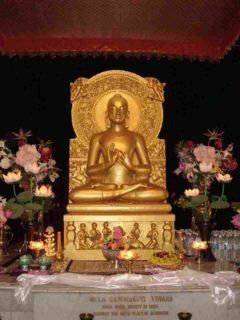 Sarnath (Skt. Sārnāth; Tib. དྲང་སྲོང་ལྷུང་པ་, drangsong lhungpa, Wyl. drang srong lhung pa), lying 10 km northeast of Varanasi in the Indian state of Uttar Pradesh, is where the Buddha gave his first teaching—the first turning of the wheel of the Dharma (see Three Turnings)—to the five first excellent disciples in Deer Park. Ashoka erected monasteries, stupas and even one of his famous pillars (see Ashoka’s pillars) there. Muslim invaders eventually destroyed the city, as they did with most of the holy Buddhist sites of Northern India, but many of the remains were excavated by British archaeologists during the 19th and 20th centuries. Today, apart from the archaeological discoveries and the museum, pilgrims at Sarnath can visit the Mahabodhi temple built by Anagarika Dharmapala, where relics of the Buddha are enshrined, next to a bodhi tree planted in 1893 from the oldest bodhi tree in Sri Lanka. Next to it are the massive remains of the Dhamekha Stupa, built by Ashoka at the very place where the Buddha is believed to have given his first teaching. And a few hundred meters down the road another stupa, the Chaukhandi stupa, marks the place where the Buddha met again the retinue of five excellent disciples who had turned away from him when he abandoned the ascetic life. This page was last edited on 31 May 2018, at 22:42.